I have an admiration for very simple solutions, and while the CardNinja — a new iPhone accessory that was on display last night at Showstoppers! — isn’t going to light anyone’s world on fire, it’s a “why didn’t I think of that?” kind of product that makes it a lot easier to treat your iPhone like a real wallet. There’s nothing complicated or ostentatious about the CardNinja. Basically, it’s just a neoprene pocket with a gummy back that you can stick on the back of your iPhone, Android or other device, and you can shove your cards or cash into it. It’s absolutely simple, and there’s not much more to say, but I’m sort of charmed by it all the same. just We see a lot of solutions here that are aimed at turning your iPhone into a wallet, and across the board they sacrified a lot of the advantages of having an iPhone — like the ability to quickly access it, or quickly pull it out with one hand and take a picture — just so you can wrap it up in a leather wallet straight from your grampaw’s back pocket. 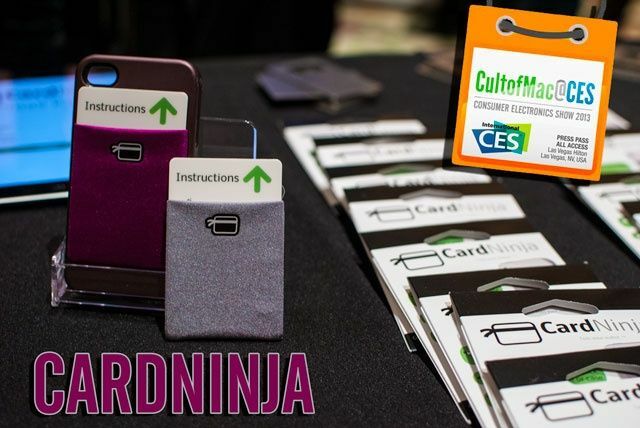 The CardNinja doesn’t try to be a real wallet: it’s just a little pocket you stick to your device, and it can hold up to 8 cards, a wad of cash, or even serve as an earbud holder. It’s not an idea that anyone is going to put on their “Best Of CES” lists, or enthuse breathlessly about to their friends, but maybe it doesn’t have to be. Something simple that just works with a minimum of fuss is worth $17.99.